During the early 1900s, when Chicago was the center of the motion picture industry, Donald J. Bell worked as a projectionist in theaters around northern Illinois, where he became well acquainted with the equipment used for showing movies. As his interest in films and equipment grew, a friend helped secure him permission to use the machinist tools in the powerhouse of Chicago’s Northwestern Railway, where Bell remodeled an Optoscope projector (lantern slide projector by Kodak) and later modified a Kinodrome projector (a vaudeville attraction and exhibition service – various changing topical motion picture shorts – by George K. Spoor of Essanay Studios. Bell met Albert S. Howell at the Crary Machine Works, where many of the parts for projectors were manufactured. Howell was born in Michigan and traveled to Chicago to work in a machine shop that built and repaired motion picture projectors. 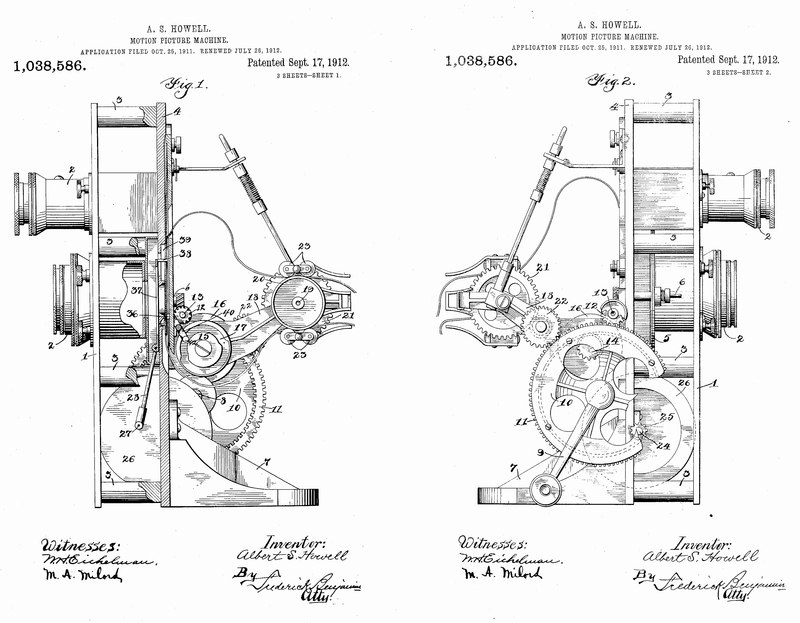 In 1906 he applied for his first patent, a device that improved framing for 35mm Kinodrome motion picture projectors. With Bell’s experience as a movie projectionist, contacts in the movie industry, and ready cash, and Howell’s inventive genius and mechanical aptitude, the two men decided to start their own business. Incorporated with a capitalization of $5,000 in February 1907, Bell & Howell Company entered the business of manufacturing, jobbing, leasing, and repairing machines. During the first year, repairs on mov ie equipment made by others represented more than 50 percent of the company’s business. In 1908 its own first designs were developed. During the next ten years the company lists twenty-one items it developed. Some of them require individual mention, although all of them undoubtedly possessed varying degrees of professional importance. 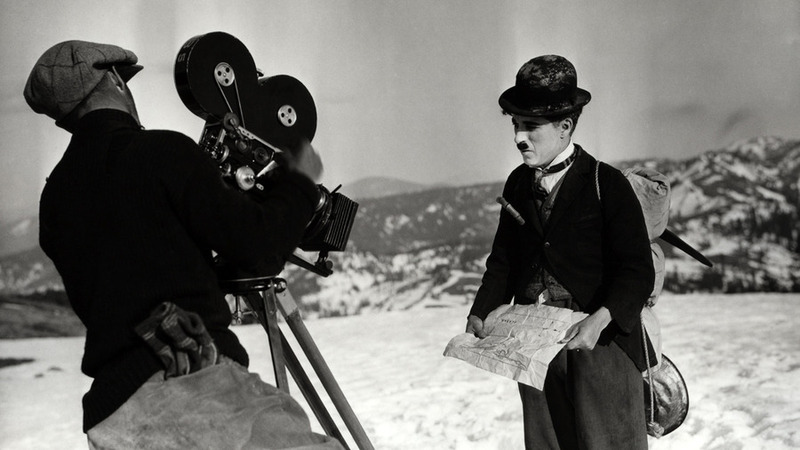 was the start of standardized 35mm motion picture equipment in the United States. In 1910, the company made a cinematograph camera entirely of wood and leather. When Bell and Howell learned that their camera had been damaged by termites and mildew during an exploration trip in Africa by husband and wife filmmakers Martin and Osa Johnson, they designed the first all metal camera.1 Introduced in 1912, the design 2709 soon garnered the reputation as “the most precision film mechanism ever made” and was produced for 46 continuous years. In 1914, Bell and Howell decided to permanently locate its offices on Larchmont Avenue in Chicago. 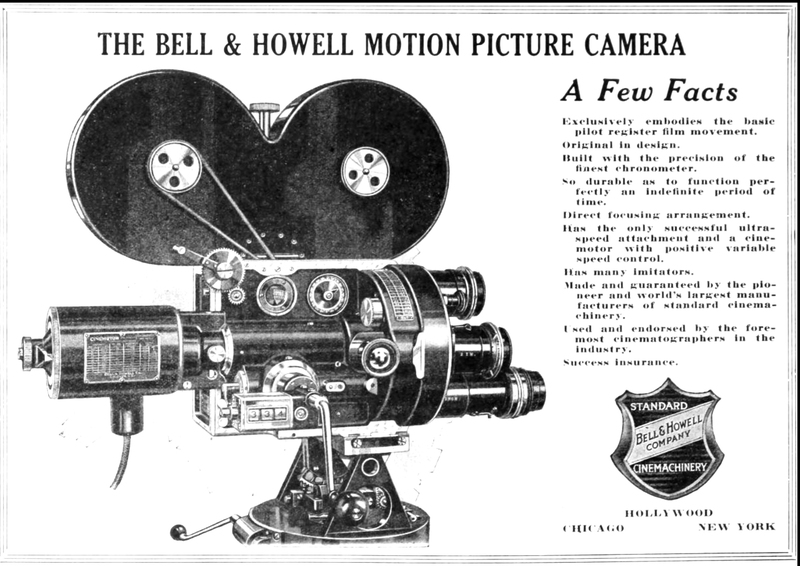 Following the relocation of the motion picture industry from Chicago to Hollywood, Bell & Howell’s first movie camera was used in Southern California in 1912. 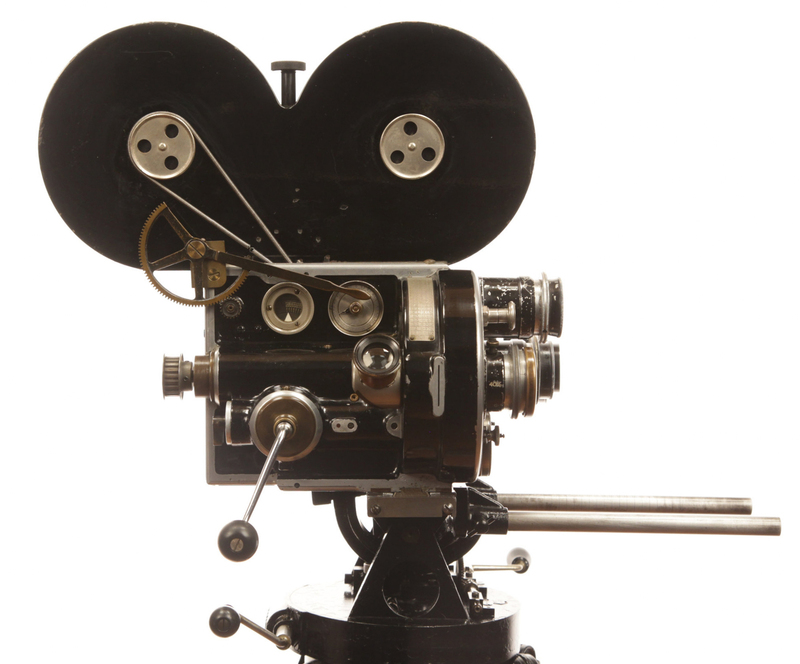 By 1919, nearly 100 percent of the equipment used to make movies in Hollywood was manufactured by Bell & Howell. The first 2709 camera went to Chicago’s Essanay in 1912, the third to the New York Motion Picture Co. in the fall of 1912. Eastman seems to have acquired Bell & Howell perforators from 1910 on. … this Bell & Howell policy had the effect of forcing customers to accept thirty-five millimeter size if they wished to have the Bell & Howell products which were quite generally recognized for their excellence and reliability. Changes sometimes come in unpredictable ways and from unexpected places. The first Bell & Howell cinematograph camera was produced in 1910. It was made entirely of wood and covered with black leather. The follOwing year moving picture explorers, Marlin and Osa Johnson, wrote that their camera had been destroyed by termites and mildew in Africa. Thus it was that some African insects were responsible for the introduction within a few months of the all·metal camera. This design 2709 standard camera was introduced in 1912 and has had a long and illustrious history. In the ’30s, Walt Disney animated Snow White and the Seven Dwarfs with a 2709 camera made in 1914, or thereabouts. The model was still being Widely used in the ’50s. Writing in 1981, L. J. Roberts states that “the Unit-I shuttle and pin mechanism of the 2709 camera is STILL considered the most precision film mechanism ever made.” This model also has become a museum piece: in England, Hollywood, and, perhaps elsewhere. 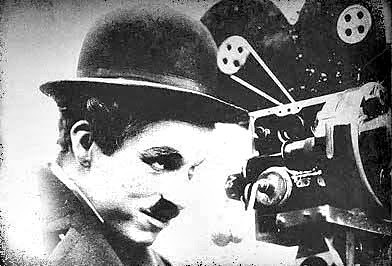 The 2709 camera which belonged to Charlie Chaplin is kept in a safe in Hollywood. In 1982 many 2709 cameras are still in use for animation purposes) These cameras were made from 1912 until 1958, a forty-six year production run. 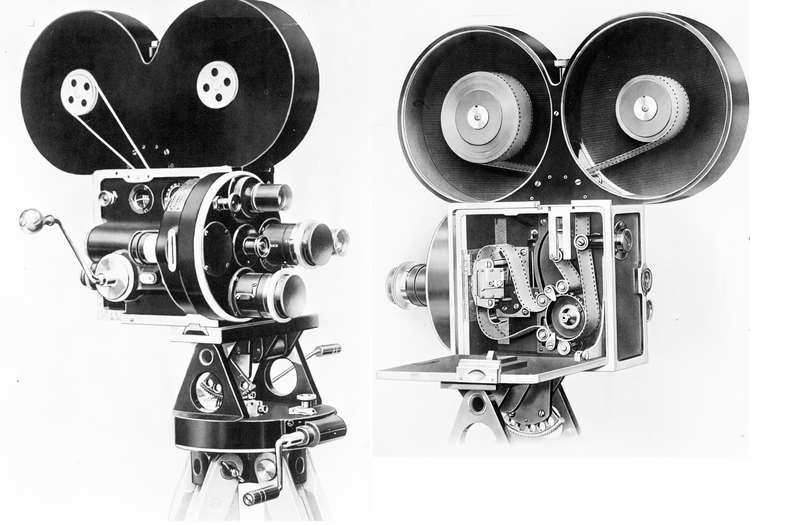 The first motion picture camera system to be built with a body machined from cast aluminum. The first to have a rack over system that allowed for precise viewing and for critical focus. The first to have register pins that held the film completely steady and in a precise position. It had 400 ft twin compartment magazines and later 1,000ft. The film movement was quite different to any that had been before; a “shuttle gate” clamped on the film and lifted it forward, depositing its perforations on fixed register pins for each advance of a frame. The fixed pin movement was used by Walt Disney in camera #50 to shoot the Technicolor feature Snow White and the Seven Dwarf. The design was so good that the basic camera body remained in factory production unaltered until 1957. Martin and Osa Johnson, traveloguers, posing in 1930 with their B&H 2709 cameras. 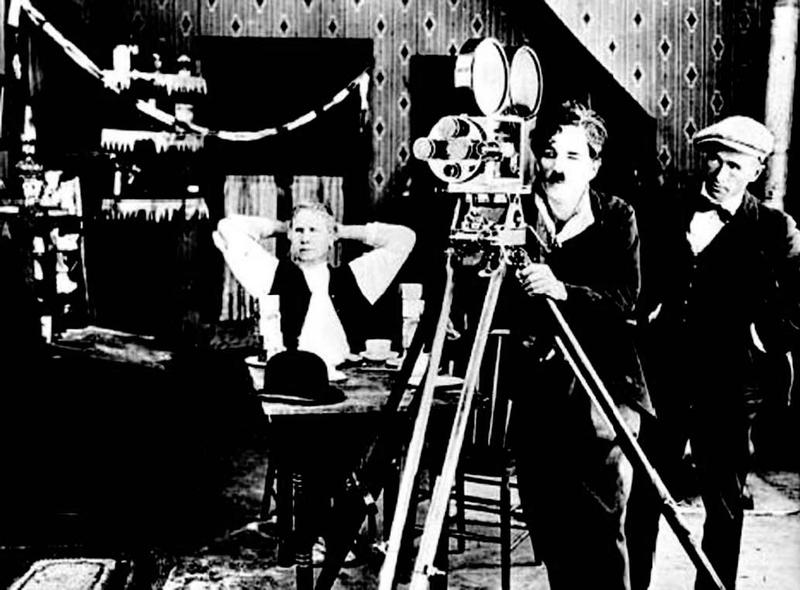 In the silent era, cameras were hand cranked by choice rather than necessity. 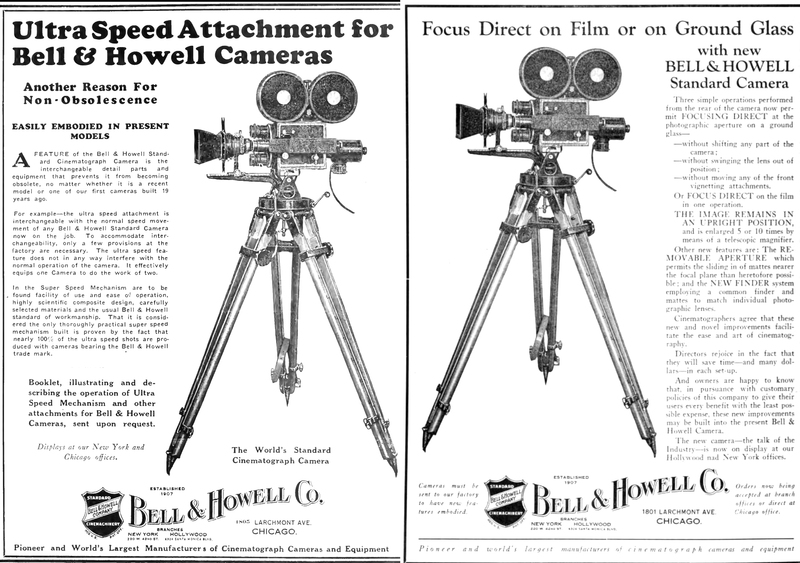 The Bell & Howell had a motorized crank, but few chose to use it. Hand cranking allowed cameramen to slow down or speed up the action. They came to know instinctively whether audiences would, for instance, be bored because the action was moving too slowly or not take a scene seriously if it moved too fast. 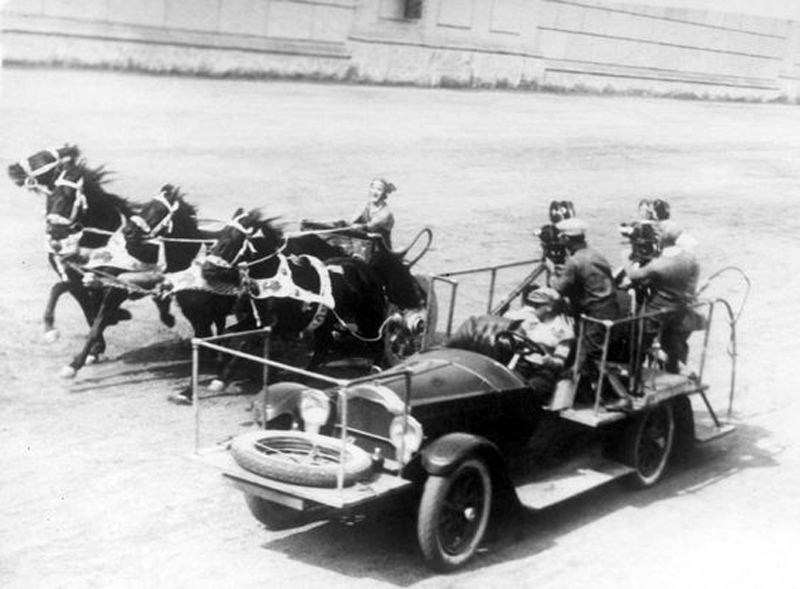 With the advent of sound synchronization, however, motorized film became necessary in order to standardize shooting speed. 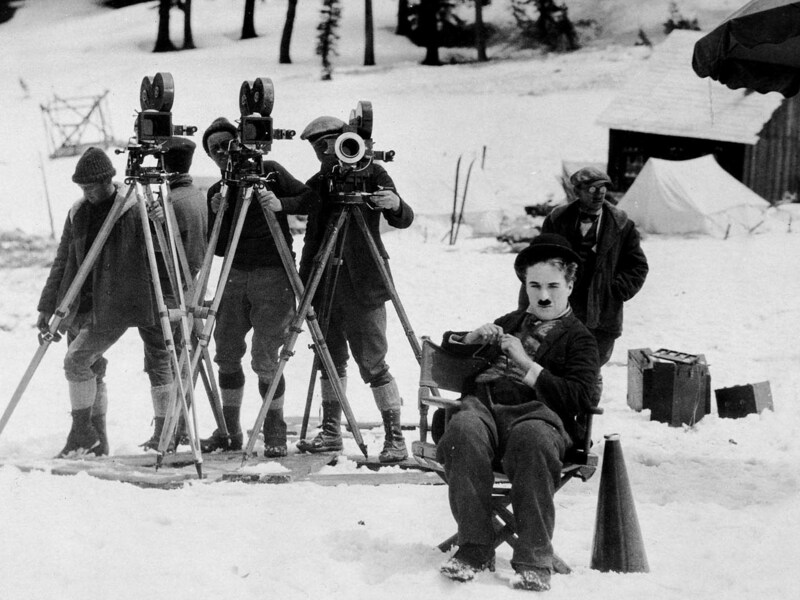 Charlie Chaplin on location for “The Gold Rush” (1925) with B&H 2709 cameras. In the midst of the company’s success, however, internal problems began to emerge. While Howell supervised production, Bell acted as a company salesperson, a job that required many long trips. In order to meet the needs of a growing business during his absences, Bell hired Joseph McNabb as both bookkeeper and general manager in 1916. When Bell returned from one of his trips, he discovered that McNabb had made drastic changes in the operation of the company. While confronting McNabb, Bell accused Howell of acting as McNabb’s accomplice. Bell gave them their last paychecks and fired them. Above, Bell & Howell 2709, serial number 668, purchased April 8th, 1925 by Cinematographer Rene Guissart, the chief cameraman on Ben-Hur: A Tale of the Christ. A Bell & Howell 2709B, serial number 653, was built in mid-1923 and also filmed Ben-Hur as well as The Big Parade in 1925. The following day, McNabb and Howell returned to the office and offered to purchase Bell’s holdings in the company. The purchase of Bell’s interests in Bell & Howell amounted to $183,895. Having contributed an initial investment of $3,500 a little over ten years earlier, Bell was satisfied with the purchase price. Bell moved first to New York and then to California and was never again associated with the company except in name. 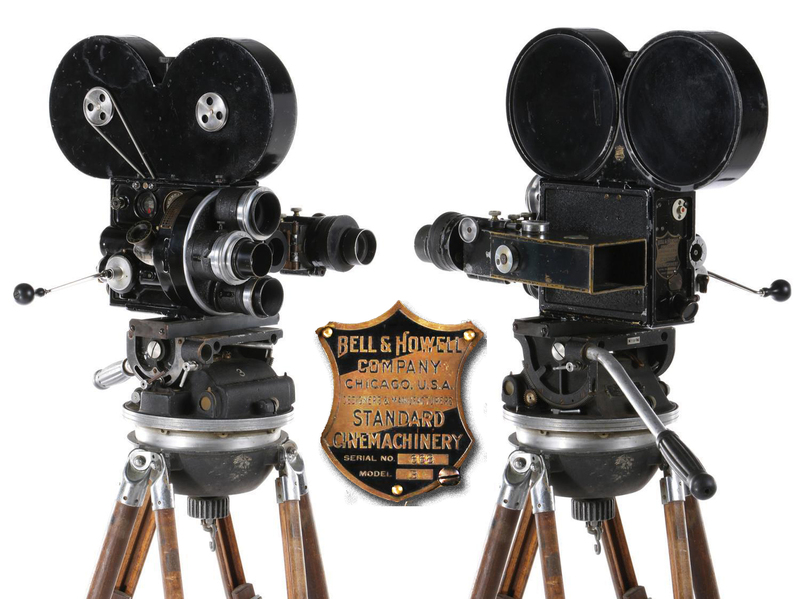 Bell and Howell had expanded into the amateur movie market in 1919 when the company began developing 17.5mm equipment. In 1921 McNabb and Howell were invited to Rochester, New York, by George Eastman of Eastman Kodak to observe experiments using l6mm reversal material. McNabb and Howell were impressed with the results and redesigned all the company’s 17.5mm equipment to use the 16mm film. In 1923 Bell and Howell manufactured the first spring-driven l6mm camera, beating Eastman Kodak by two years. The demand for this camera was so great that, even at a price of $175, it was on back order until 1930. Patent No. 1,038,586, Albert S. Howell, of Chicago, III, assignor to Bell & Howell Co., a corporation of Illinois, is for a motion picture machine, but relates particularly to the film feeding mechanism proper, the object being the provision of a simple and effective mechanism for feeding the film intermittent, or step by step, which shall have a high degree of accuracy so that the film will be moved exactly the required distance each time. Through the medium of a vibratory flexible plate the perforated film is made to engage alternately with fixed pins which effectually prevent any movement or slipping between the feed strokes or steps, and with reciprocating pins which forward the film. Hence the main claim is for film feed mechanism comprising a film guide way, means for shifting said guide way transversely to its direction, reciprocating pins adapted to extend into said guide way and engage the film therein in one position of said guide way, and fixed pins adapted to extend into said guide way and engage said film in the other position. Also, specifically a flexible fllm guide way and means for flexing said guide way to bring it into and out of the path of the reciprocating pins. The adjoining figure represents an elevation of one side of a moving picture camera partially in section, in which the invention is embodied, showing the manner of actuating the feeding mechanism. ROBERT R. McCORMICK of The Tribune sailed yesterday from New York en route to the European war zone. 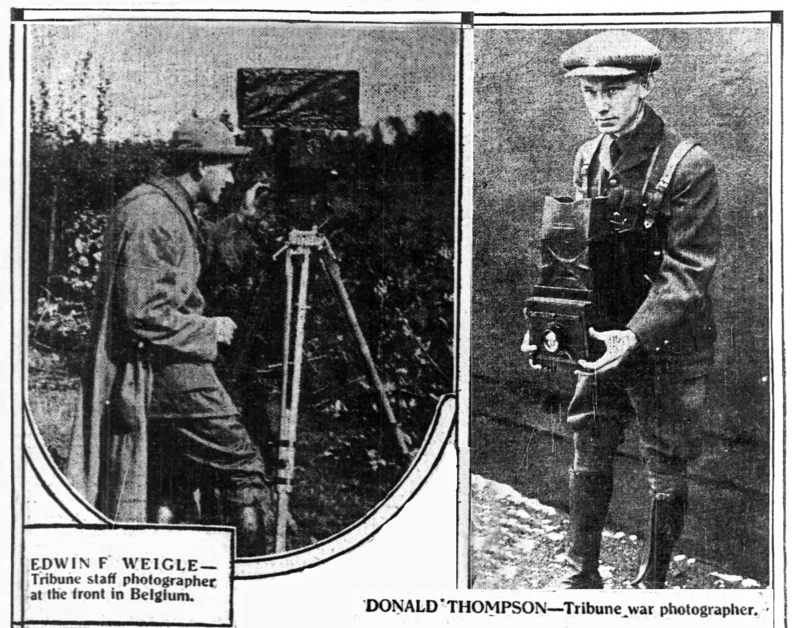 He was accompanied by Donald C. Thompson and Edwin F. Weigle, The Tribune’s two world famous war photographers. Mr. McCormick’s ultimate decision is the headquarters of the commander in chief of the Russian armies. He expects to penetrate to the battle front in the eastern war arena. He sailed on the Adriatic for Liverpool and will stop at London, and then proceed to Petrograd through Norway and Sweden. Mr. Weigle, whose pictures of the fighting in Belgium gave him a world wide reputation as an intrepid war photographer and as preserver of accurate history, goes direct to Germany to join James O’Donnell Bennett, The Tribune’s war correspondent now with German forces. Arrangements similar to those made last fall with the Belgian Red Cross are pending with the German authorities. It is planned to send Weigle to the firing line with the German forces and picture the hostilities on the battle front. Mr. Thompson will go to the front in France and Belgium and after covering this war zone will hope to reach the eastern battle lines. Thompson and Weigle are today perhaps the two most famous war photographers in the world. Weigle first won his spurs in Mexico. He was at Ver Cruz when the American soldiers landed. The snipers began firing from the windows and housetops on the United States troops. Weigle’s companion shouted to him to “duck” and started to run. Weigle went in the other direction—toward the place where the firing came from. He got the actual pictures of that clash. When the European irruption broke forth Weigle packed his kit and said he was ready. He accompanied Joseph Medill PAtterson to Europe and under the arrangement of with the Belgian Red Cross he was the first photographer actually to picture the bloody battles and the burning of the cities throughout a greater part of the war zone, being attached to the Belgian army. Thompson—”Shrimp” Thompson, as he was known in the German trenches—is the young Topeka corn fed product who has written K-A-N-S-A-S across the war map of Europe. He was in thirty-two battles in Belgium, large and small, but taking only still pictures the first weeks of the conflict. He fell in with Weigle at the bombardment and burning of Antwerp, and the two were together considerably after that. On the night of the bombardment of Antwerp Thompson and Weigle were in a coal bin in the basement of a house at 74 Rue de Paris. Their house was hit with a big shell and they clambered upstairs and put out the fire, then went back to their coal bin. They were in the coal bin about twenty hours. Then they went out and photographed the city burning, the dead in the streets and the flight of the refugees across the pontoon bridge. Thompson had a part of his nose shot away at Dixmude. Both boys came back home for a rest. They are now on the ocean on their way back. Both allowed before departing from Chicago last week that if the charmed life sticks with them this trip, they will photograph this war up and down, sideways and backwards, and will come back with the greatest collection of war films the world perhaps ever will know. The Chicago Tribune’s German War pictures, taken by Edwin F. Weigle, Tribune war photographer, were given their first presentation at the Studebaker, Saturday, August 28. The Studebaker box office has given out that 10,000 people viewed the pictures during the day. Mr. Weigle gives an interesting lecture, recounting his experiences during the taking of the pictures. The Tribune-Russian war pictures, which had a memorable week’s showing at the Studebaker, were transferred to the Midway Gardens, East 60th street and Cottage Grove avenue, where they are being viewed by vast audiences nightly. After their run at the Studebaker, the German war pictures will be transferred to the Bismark Gardens, on the North Side. Scenes from the archives of the Imperial War Museum, showing the 35th Division, American Expeditionary Force, shortly after the collapse of the division during the Meuse Argonne Offensive. Filmed on October 18, 1918 by 2nd Lt. Edwin F. Weigle and his camera operator Pvt. Thomas J. Calligan. Mr. Weigle used a Bell & Howell 2709 camera, serial number 250. In the period before and during World War I, American newspapers were involved in a cutthroat war to increase circulation. To do so, they increasingly turned to tie-ins with the new popular medium of motion pictures in order to boost readership, and to increase newspaper profits by theatre receipts as well. In response to these pressures, the Chicago Tribune decided to groom photographer Edwin F. Weigle as its film correspondent overseas. To this end, it sent Weigle to Vera Cruz to film conflict in April 1914, and in August, after the World War broke out, to Belgium. In 1915 and 1916 the Tribune sent him to Europe on two different occasions, where he made feature documentary films. When the United States entered the war in 1917, Weigle joined the U. S. Army Signal Corps, and filmed with the 35th Division in France. After the war, Weigle and his wife filmed in Ireland during the Troubles in the 1920s. Weigle retired as a film correspondent shortly after World War I.
Edwin Weigle was born in Chicago, Illinois on March 13, 1889 and died in Deerfield, Illinois, on August 1, 1973. 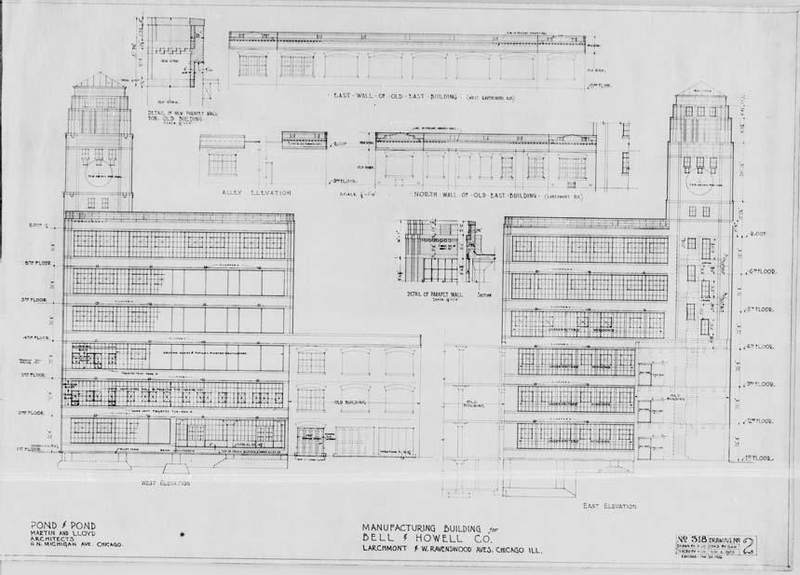 Additions, 1925-27 – West and East Elevations. Sheet #2. Microfilm roll #27a, frame #3-16. 1 Martin Elmer Johnson and Osa Helen Leighty first met in April, 1910. Their first shared physical contact with Africa was in 1920. The official story and motive for Howell to design an all-metal camera is a debunked myth. Wow! Thank you so much for all this information surrounding one of my favourite cameras! Hello, I work for Film Archive (Public Organization), Thailand. Our archive is one of the FIAF members. We are planning to hold an exhibition about 5 great movie cameras in film history and Bell & Howell 2709 is definitely among them. The exhibition is for educational purpose, so the admission will be free. I came across your website while searching for information and found these beautiful drawings of the B&H 2709 camera and also the photo of the great film director, Charles Chaplin working with the camera. I am hoping to get permission to use the photos in our exhibition board. Or if you have them in a better resolution of digitized photos, I would like to have a copy. If there are any fees for this service please kindly advise me.